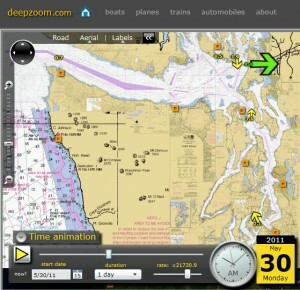 I’ve begun to click on a website called DeepZoom, a site that takes you into an animated wonderland of tides and currents. Software developer Jay Alan Borseth of Seattle is using Microsoft’s DeepZoom technology to weave together hundreds of charts and maps, allowing the reader to quickly scan and zoom to the location of interest. The whole thing runs on Silverlight. Unique features about the website are not the static maps but the ability to watch changes in tides and currents. Pick a location, type in the date and set the duration of time you wish to review. Use the slidebar to set the clock for checking on tides and currents at a specific time. Or click the start button to play through the animation for the sequence you have chosen.